Try changing LargeFieldsConfig.txt and see if that helps. Ah, that would be the one I'd say, given 1900 characters were displayed while idle but not more (in mine the max is set to '2000'). Had forgotten it was configured in a standalone file. 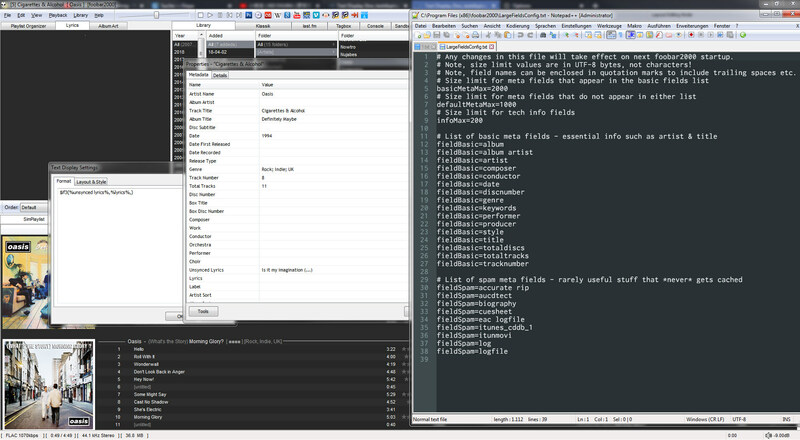 I only recently updated foobar from some pre 1.0 version. I'm on win7x64, foobar 1.4 beta 8. Update: I have noticed that if "Prefer playing track" is enabled, the lyrics -do- show. Disabling it again shows the dot again. So it seems like this is a bug within Text Display. Ironically this seems to be rather similar to a bug I reported 10 years ago after the initial release. How time flies. I doubt that this component is still under development though, so I suppose this workaround is as good as it gets. IMO, a text display component is absolutely essential and should be part of foobar's native basic installation. Let's just hope the legendary @foosion gets to see this ! Anyone know if there's a solution to this little annoyance? It's easier to explain with screenshots. The text displayed changes according to whether an item is playing or selected etc, and it works fine when the "prefer playing track" option is checked, but not when it's unchecked. When a track is playing it looks like the first screenshot. When there's no track playing or selected and "prefer playing track" is checked, it behaves as I'd hoped. See the second screenshot. But when there's no track playing or selected and "prefer playing track" is unchecked, it displays as per the third screenshot. It's only a minor annoyance but I'm still learning when it comes to fb2k's syntax, so I'm wondering if there's a way around it I'm not yet aware of. The syntax for the orange text in the screenshots is below (that's what I'm trying to fix if I can). Is there a better way to do it? Even with Preferred Playing Track unselected, I cannot get lyrics to display.